HPCL HP Re-Fuel™ is the only online rewards program in the country that updates your points by the minute; a deserving benefit for our most valuable customers. Now, HPCL HP ReFuel App is offering 1 Litre free fuel on purchase of 5 Litre or more fuel at all HP Petrol Pump+ Rs 10 Cashback on Spend of Rs 100. So, Hurry up!! How to Get 1 Litre free fuel on purchase of 5 Litre or more fuel at all HP Petrol Pump+ Rs 10 Cashback on Spend of Rs 100? This campaign is applicable on purchase of Petrol, power, Diesel and TurboJet, thru HP Re-Fuel Loyalty Program such as HP Re-Fuel Card, Cardless, QR Code and Paycode. This campaign will commence at 00:00 hours on Sept 01, 2018 and closes at 23:59 hours on Oct 31, 2018. Customers will be given flat Rs.10/- as “Campaign Participation Bonus” for first Transaction done during campaign period on a minimum transaction value of Rs. 100/-. 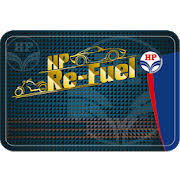 This will be credited to HP Re-Fuel Wallet on next day, subject to technical issues, if any. Customers can Earn 1 Litre free fuel on purchase of 5 Litre or more fuel thru HP Refuel in a single or multiple transactions, subject to maximum of Rs 100. For redeeming 7500 Drivestars (Rs 75), customer has to exercise the option of redeeming campaign drivestars. Upon doing so, the wallet will get added by Rs 95. CAN I GET 1 LTR FREE PETROL ON PURCHASE OF 5 LTR ON HP REFUEL CARD???????? ?